Most of the hikes in Cape Town involve scaling a mountain (if you hadn’t already noticed, there are a fair number in the city). 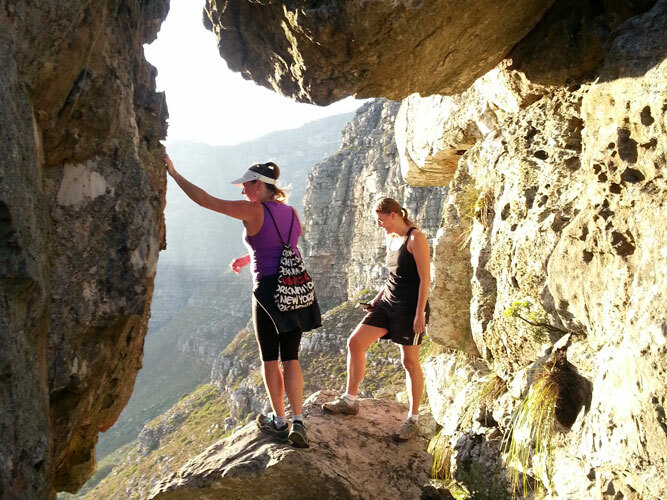 If Tranquillity Cracks, Platteklip Gorge, Maclear’s Beacon and India Venster are not on your list of must-do hikes, then this list of ‘sedate’ trails, even if one or two involve a short (though not overly taxing) uphill, is for you. The Pipe Track is effortless and follows a path between Kloof Nek and Kasteelspoort, adjacent to Table Mountain, with views over Camps Bay and Lion’s Head. Best of all, it’s all on the flat, unless you start from the Camps Bay end (park in Theresa Road and enter by way of a gate), in which case the initial climb up to the Pipe Track is nominal. The trail follows the pipeline built in 1887 that transports water from dams on Table Mountain to the filtration plant on the path. A slightly more taxing hike, particularly in summer. However, it is still classified as not difficult, and children love it. 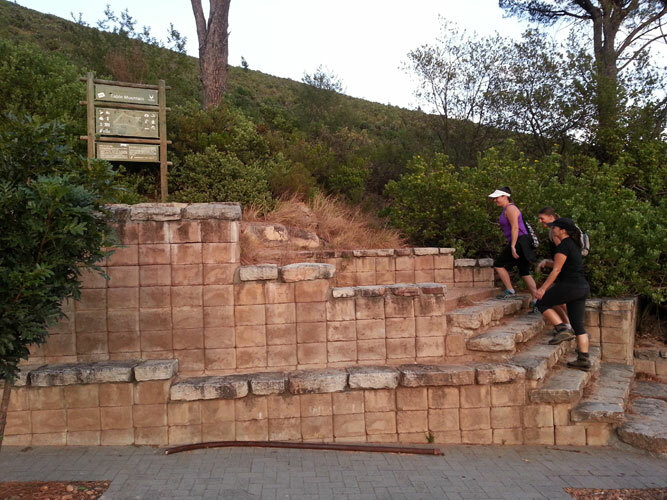 Leave from the car park at Silvermine’s reservoir and follow the signposted jeep track up the mountain. At the top of the ridge rest in the shade of pine trees that provide views over the Cape Flats. From the fire lookout hut, the bulk of the hike beneath your belt, are further excellent views. The steepest part of the hike takes you to the big hole that is Elephant’s Eye. The path is easy, the views stupendous. Take a picnic. This is possibly the easiest hike on Table Mountain, and the best alternative to Lion’s Head for sunsets (this way you avoid the crowds). It is also perfect for after work, or for those without the time for a long hike on the mountain. 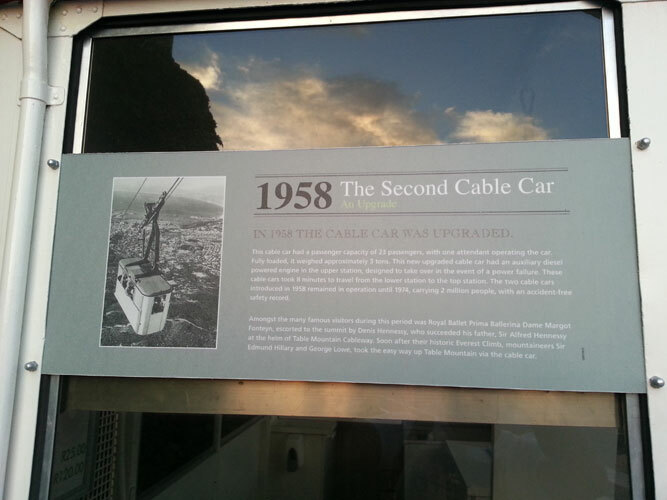 Drive to the Table Mountain cableway, and park on the first left hand hairpin bend on Tafelberg Road. Kloof Corner begins across the road (there is a sign board). Follow the zigzag path, initially up stone steps and then log steps, straight up to the contour path. Once on the path, follow it until just below the cableway (or continue). The views up here are magnificent. Park at Constantia Nek and head along the contour path all the way to Kirstenbosch (either leave a car at both ends, or do it return). Most of the contour path is problem free, although there are a couple of climbs and wooden steps. If you are in two cars store a picnic lunch in the car at Kirstenbosch (cooler bag is essential), as the hike is just long enough to work up an appetite. There is the occasional fork in the road that can be confusing. Acquaint yourself with the route beforehand. You start and end this hike from Cecilia Forest, just off Rhodes Drive. Follow the jeep track through forest and onto the contour path. 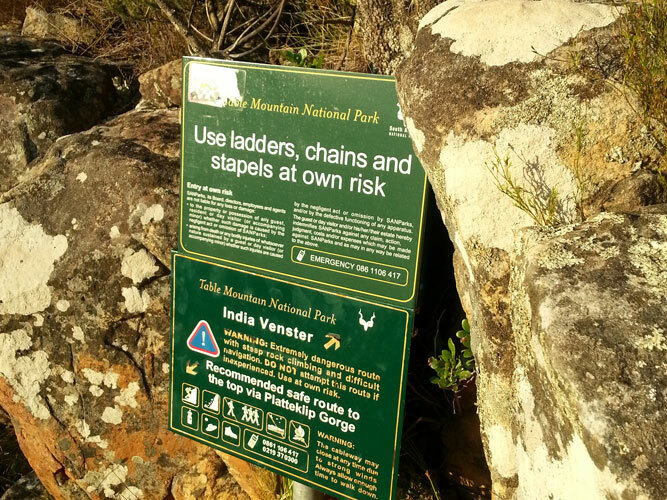 When you reach the outskirts of Kirstenbosch, follow signs to Cecilia Ravine/Rooikat kloof (you can also begin the hike from Kirstenbosch, but this alternative is tough; lots of steps). It may get heavy going up Cecilia Ravine up the log steps, particularly in summer. You round Cecilia Ridge and into Cecilia Ravine where Cecilia Waterfall is in a cool, leafy and moss covered enclave. Not good for small children. A relatively painless hike if you don’t mind a short but significantly steep climb (which means it is neither difficult nor extremely easy, and it isn’t good for little children). The climb is steep and even, but there are opportunities to stop and catch your breath (the stops allow for the views), followed by a rocky climb and a couple of metal ladders (there is an alternative route for those who get shaky when faced with chains). The last 20 metres involve hand-over-foot rock climbing, but the scramble is not extreme and is over quickly. The 360 degree views at the top are worth it. Take a picnic, but watch the return down the mountain. It may get very busy at full moon. 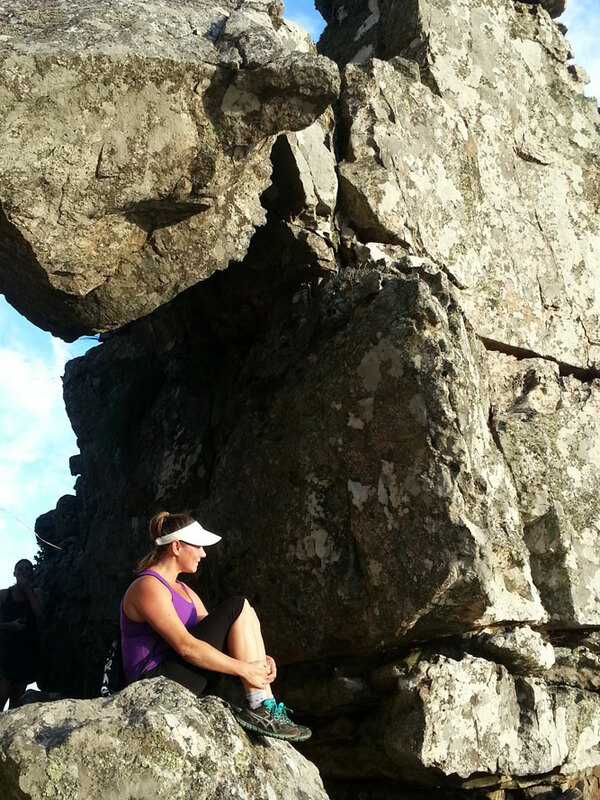 Located halfway up Devil’s Peak, this is a large cave above Salt River and Woodstock. There are two routes up: one via Tafelberg Road – park right at the end of the road and walk the dirt road; the hike starts just before a metal gate, the other via Rhodes memorial (provided it’s still there! 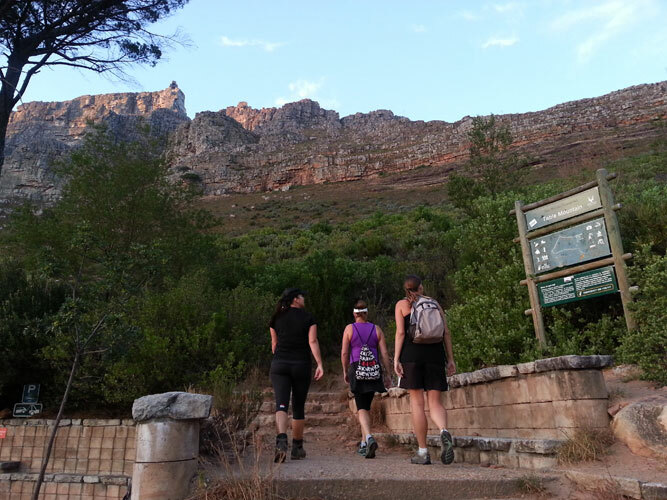 )- head off towards the Kings Blockhouse, following the path around the mountain to Cape Town. From the cave the views over the city and the peninsula are impressive. A short but strenuous climb, with a bit of a scramble at the end, brings you to the top of Klein Leewkoppie, which separates Hout Bay from Llandudno. Start at Mount Rhodes Drive in Hout Bay. Wave at the security guard as you enter Mount Rhodes, for he will buzz you through the gate once you’re parked (CCTV controlled). Walk the tarred road until the mast. With your back to the mast you will see the trail head up the ridge (the paths to the right above Llandudno are dead ends). The cave is not difficult to access, above Kalk Bay (great for novice caving), and is perfect for children. The sign Echo Valley is on Boyes Drive above Kalk Bay station. Hike up the steps, following signs to Boomslang Cave. A small green sign marks the cave at the top of the valley gorge. Entering the cave entails a crawl on your hands and knees. Whilst visitors to Cape Point head to the old lighthouse, there is another short trail running below the lighthouse to the new lighthouse (follow signs to Cape of Good Hope) that takes one along the cliff-face and gives a different angle of the old lighthouse from below. Walk through fynbos with the sea below you. Return the same way.